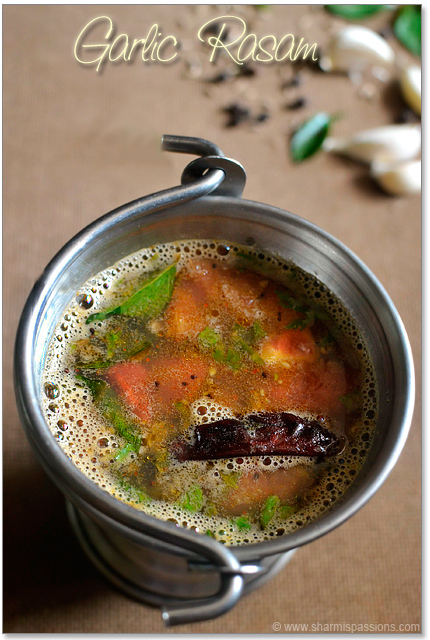 Garlic Rasam is one of the very common rasam recipes(with no rasam powder) we often make especially for for those cold rainy days pairing it with rice, rasam, paruppu thogayal and apalam which makes the best comforting lunch combo! One of the very few recipes I learnt while I started cooking was rasam but still it took almost a year to confidently post it here as I wanted to perfect myself first before I share it to you 🙂 I have already posted paruppu rasam recipe long back, but promise to post more rasam recipes often. 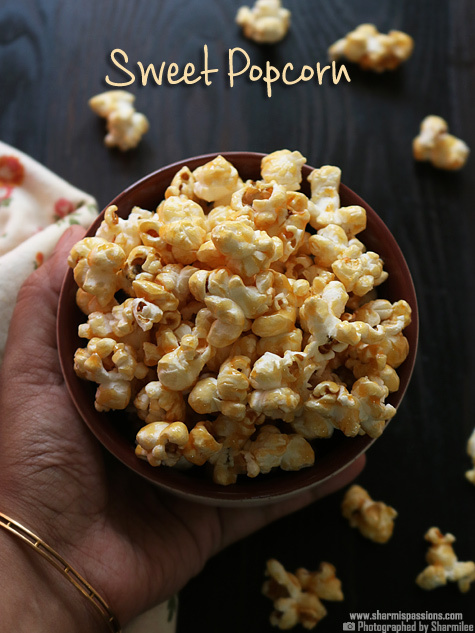 1.Grind the ingredients listed under ‘to grind coarsely’ to a coarse mixture.Set aside. Crush the whole garlic with skin just roughly and set aside 2.Soak tamarind in 1.5cups of water and extract pulp.Add the coarsely ground mixture to this and mix well.Set aside. 3.In a pan – heat oil add the ingredient listed under ‘to temper’ saute for few mins till raw smell of tomato leaves.Boil the tamarind mixture for 3mins for the raw smell of tamarind along with crushed items to leave…then add the tempered items to the tamarind mixture. 4.Add required salt and let it simmer for 2mins.When the rasam is frothy and is boiling, garnish with coriander leaves and switch off the flame immediately. 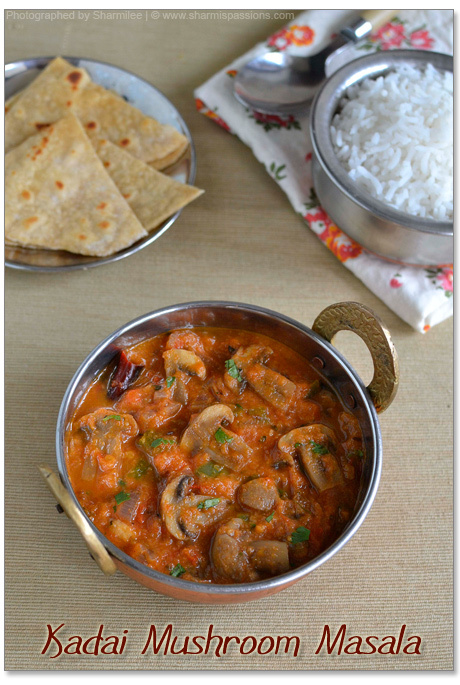 Serve hot with rice and any curry of your choice! 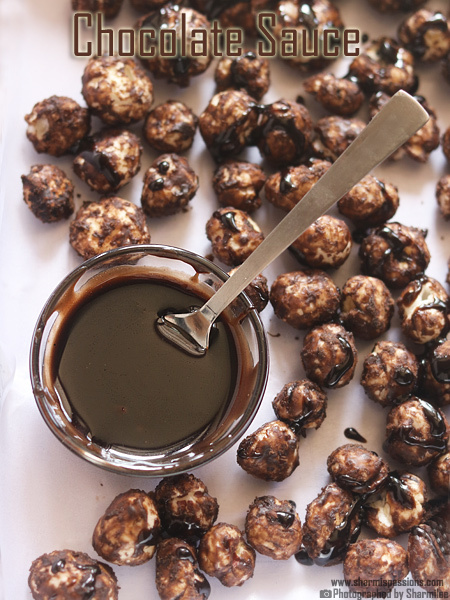 Make sure to boil the tamarind with crushed items for the raw smell to leave. Then just leave for a single rolling boil , dont let the rasam boil for more time thats the main key to make a good rasam. I love eating whole garlic so always add few while tempering. Your last line says "serve as a tea time snack"!! Your last line says "serve as a tea time snack" !! Flavourful and my comforting food. 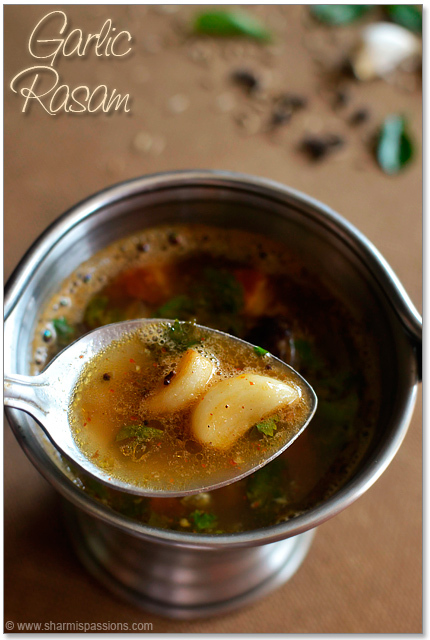 Love this garlic rasam. I addicted to garlic.. looks too good. I can finish the whole bucket…I did this weekend also. Garlic is very good for health.. Thanks for such a healthy recipe..
very healthy and easy drink.have to make this one today. Wow ! 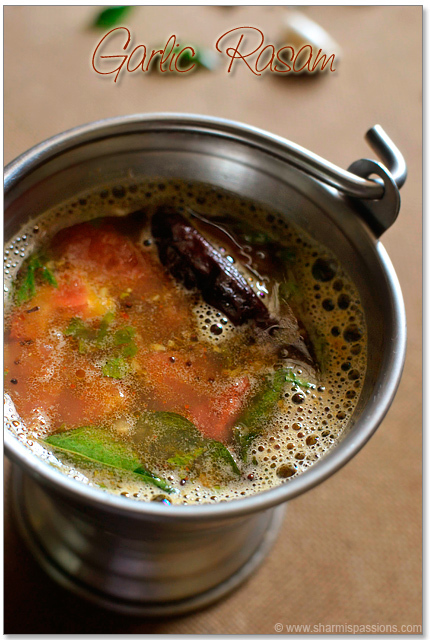 Healthy and flavored rasam..
Am sooooo drooling.. very aromatic and very flavorful rasam… so yummy!!! 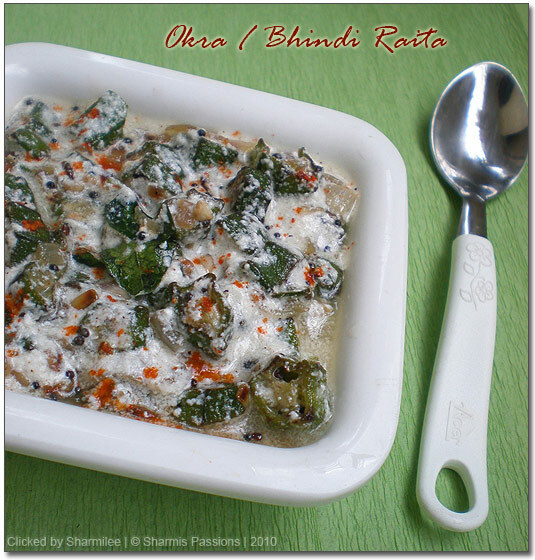 This is one of my fav rasam. 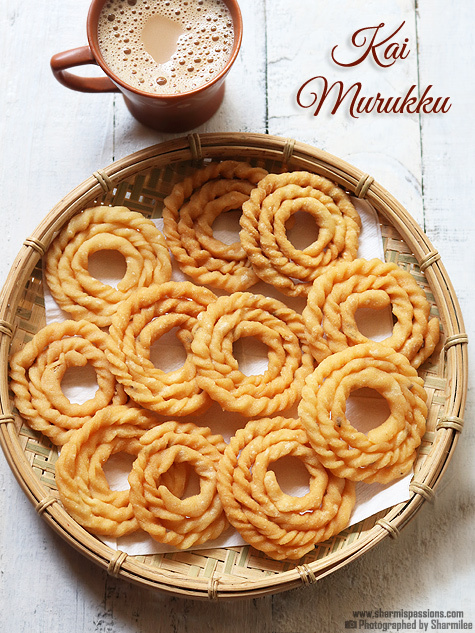 My mom used to make this quite often when i was a kid. Yummy!! Just made it and it came out awesome. I left out the green chillies and garlic from the grinding part, but followed other steps. I am going to adopt this method henceforth 🙂 Thanks! can we dry roast cumin and pepper?i followed the recipe as it is but found that the spices were not properly ground as they were raw…..why have u not dry roasted the spices….do we need to take them raw only for this recipe….? Yes we usually grind the spices raw for garlic rasam…as anyways it is going to boil with other ingredients we dont find the raw smell..But if you prefer you can dry roast and grind cumin, pepper and then add it. Great recipe, perfect results. Thank you! Tried it today came out really well…Thanks for the recipe.. 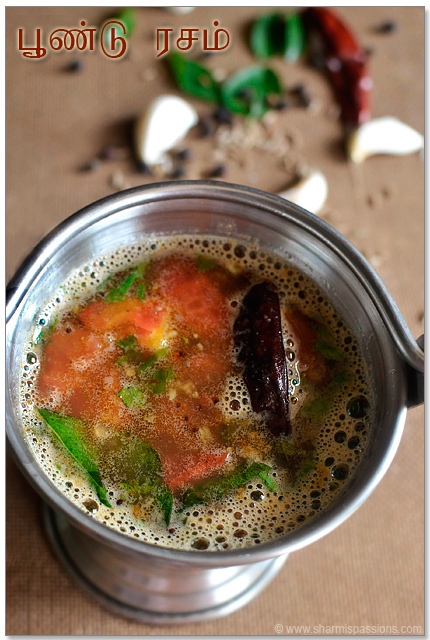 Tried this rasam today..came out really well…Thanks for the recipe..
Made this yesterday. Hubby loved it. Thanks so much! Thank you so much for your recipe. My husband loves my rasam but he always says there's like something missing but he doesn't know what. Hahahaha. I would love to try your recipe but I have no idea what hing is. Can you let me know? Sharmi, am a big big fan of ur space and even on the pan u used here. Thought of buying this pan, just a quick question, is there any specific name for this pan ? came out really good, perfect consistency whenver I make it wll be very thick. Thank you so much for the recipe. looks delicious. 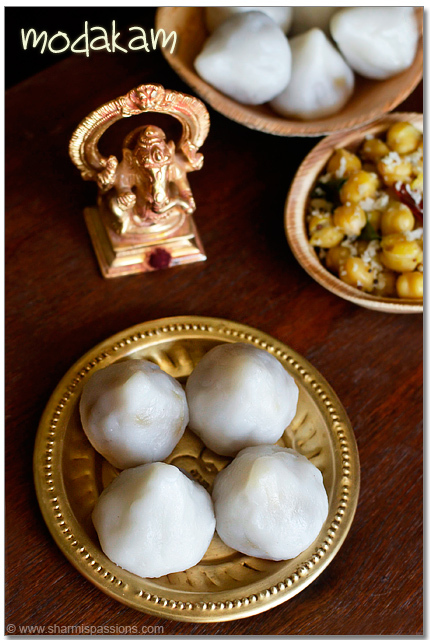 what is the vessel(glass like) you used for making rasam. its nice.